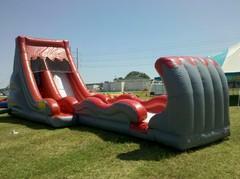 Pick a date, Pick an inflatable, Reserve it Now! We deliver to New Braunfels Texas, San Marcos Texas, Kyle Texas, Buda Texas and surrounding areas. Please call if you have any questions or if you don't see what you're looking for! Jumps For Joy is insured and state inspected. We have a large selection of inflatable rentals including moonbounces, jump houses, water slides, dry slides, combos, obstacle courses, bouncy boxing rings, bungee runs, snowcone machines, cotton candy machines, popcorn machines, tables and chairs. We have everything you want, the way you want it and on time. 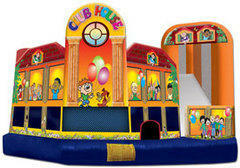 Welcome to Jumps For Joy Party Rental! We have been servicing the area since 1996. Jumps For Joy is state inspected and insured. Whether you call them bounce houses, moonbounces, jump houses, jump castles, moonwalks, jumpers, bouncers or even a kids' party inflatable thing, we call them fun and we have a great selection with all of your favorite characters. 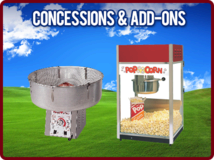 We also have inflatable slides, obstacle courses, combos, inflatable boxing rings, bungee runs, water slides, chairs, tables, and concessions (including popcorn machines, snow cone machines and cotton candy machines). We deliver to the following areas: San Marcos Texas, New Braunfels Texas, Kyle Texas, Buda Texas, Canyon Lake Texas, Wimberley Texas, and Seguin Texas, as well as surrounding areas (delivery charges may apply). The zip codes in our delivery area include 78130, 78132, 78666, 78640, 78610, 78133, 78155, 78676, as well as others (delivery charges may apply). If you would like to rent a bounce house, combo, water slide, obstacle course, bungee run, combo, velcro wall, giant dry slide, or other inflatable, but are unsure of whether your location is within our delivery area, please give us a call. Reservations can be made online or over the phone. So whatever you want to call them, give us a call or reserve on-line and we promise a great time.